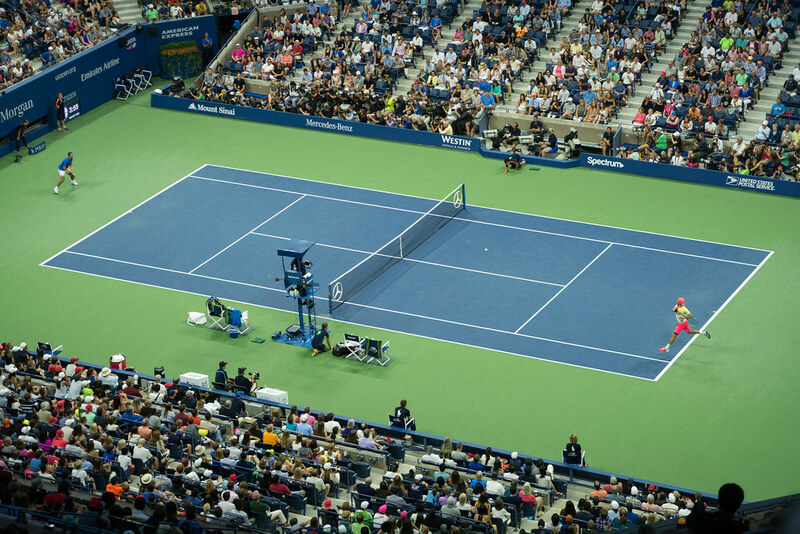 For many years, I’ve wanted to go up to New York to the US Open, but I’ve never actually made it happen. 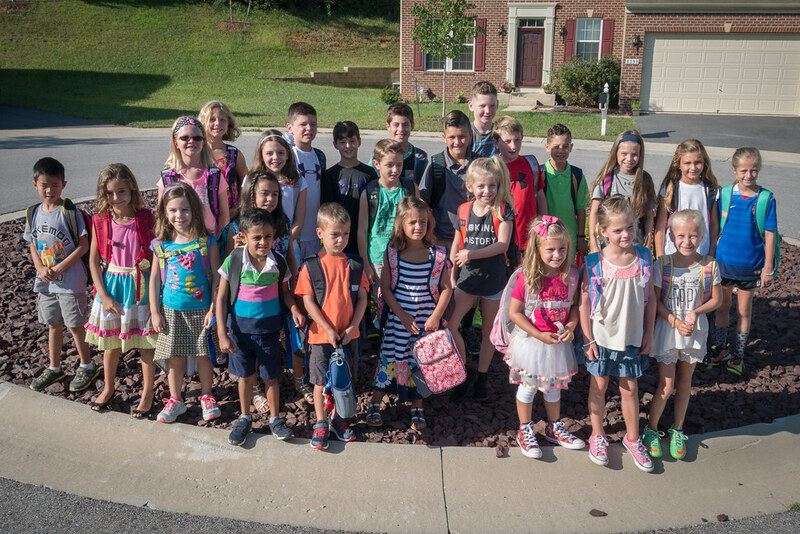 It’s usually the first two weeks of school, and there’s a lot going on around home. Not to mention that it’s expensive. But this year was going to be different. Since Leah has now really gotten into tennis, I figured I had at least one other person who’d be really excited about it. So, I decided I was going to make it happen this year. Or at least try really hard. Because of school, the only time we could go was Labor Day weekend (the middle weekend of the tournament). This is the worst time to go, as it’s the most crowded and the tickets are more expensive (supply and demand). 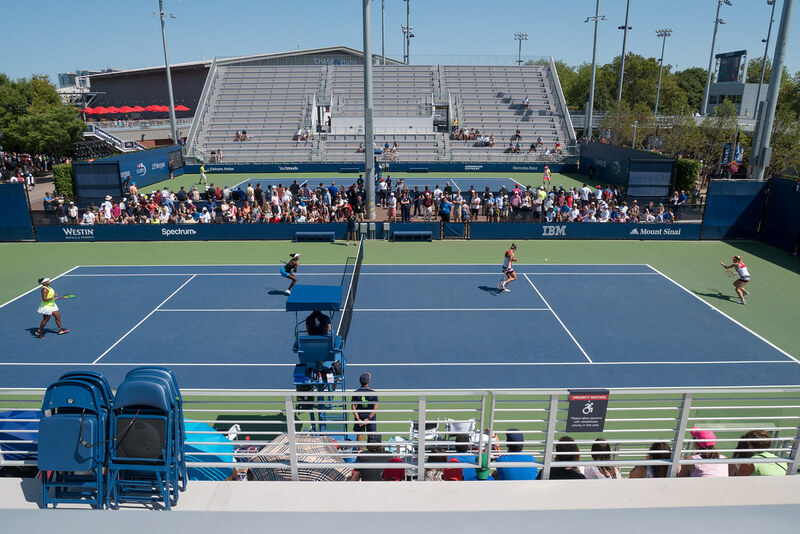 I’m a USTA member, which meant I could get early access to ticket sales. But, the day they became available, there were already very few tickets available and they were very expensive. Hotels were also expensive. So I waited and kept checking. Things did not improve. Eventually I came up with an alternate plan - just go for one day. That would mean only buying tickets for one day, and no hotel stay. And, in reality, I’m not sure the rest of the family would be up for multiple full days at the tournament. I also decided to wait till the last minute to purchase tickets in the hopes that prices would drop as sellers tried to unload them. My plan ended up working well. I bought tickets from Ticket Liquidator on Saturday to see the tournament on Sunday. 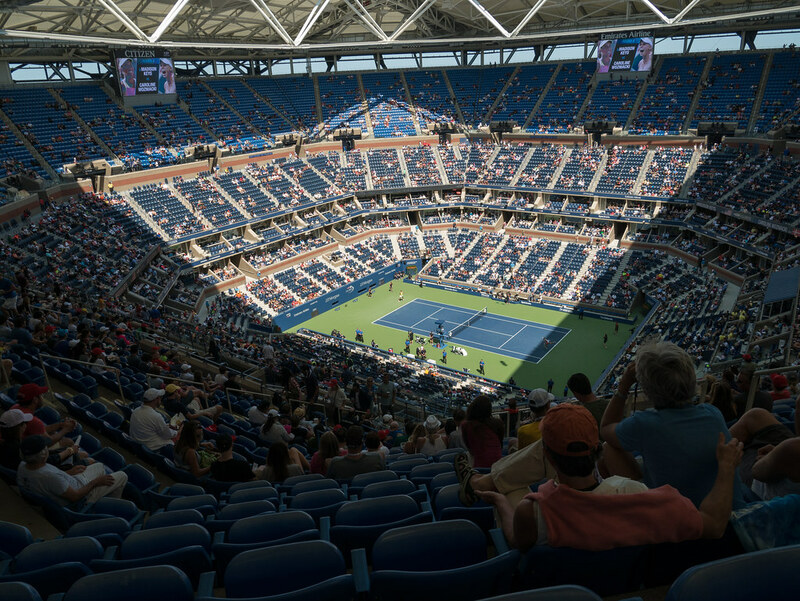 They were even tickets with reserved seats in Arthur Ashe Stadium, not just grounds passes. Then we woke up early and left our house at 7:45 to drive up to New York. It took a bit under four hours of driving, then an hour to get parked, shuttled, and in the tournament. 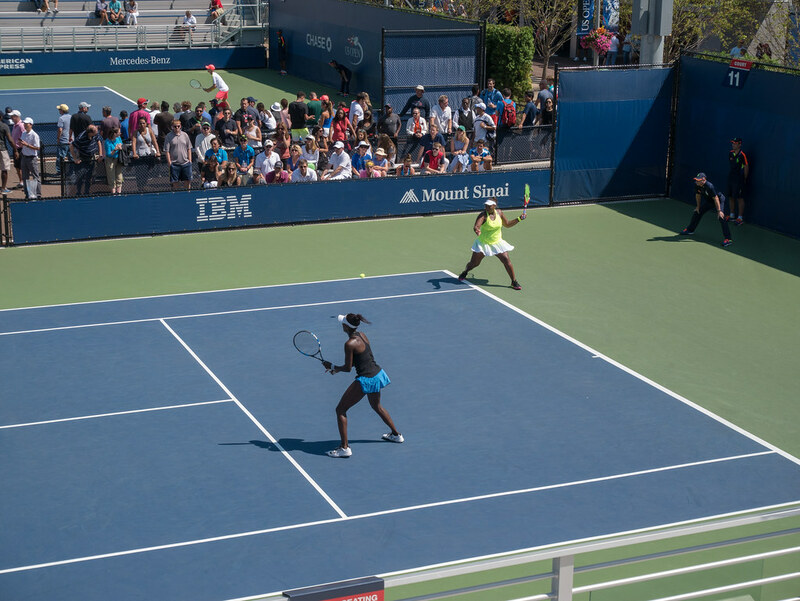 Our first stop was to see Taylor Townsend and Asia Muhammad (unseeded Americans) play doubles against Tímea Babos and Yaroslava Shvedova (the number 3 seed). They were playing on court 11, which is a great court. 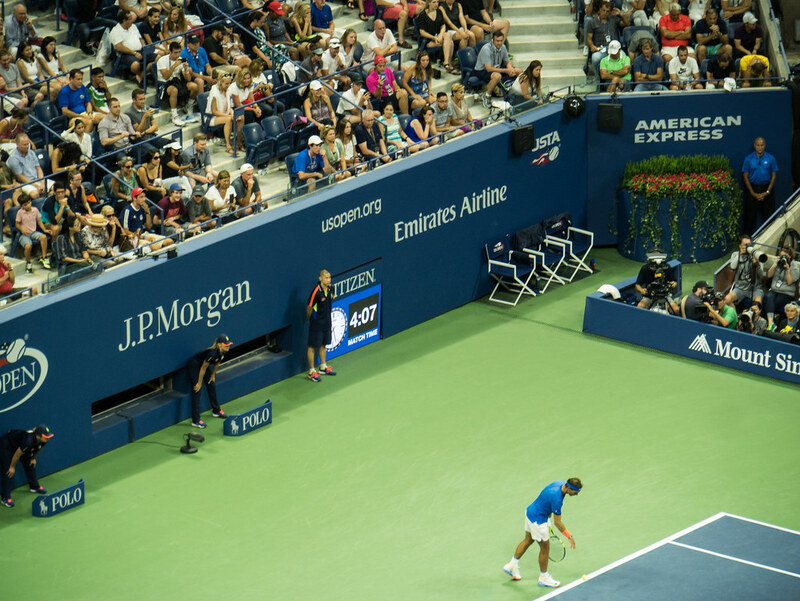 We sat in the stands, though we later returned to court 11 for a different match and sat on the other side right next to the court. The Americans lost the first set 6-0, but came back to win the next two sets 6-4, 6-3 to advance to the quarterfinals. 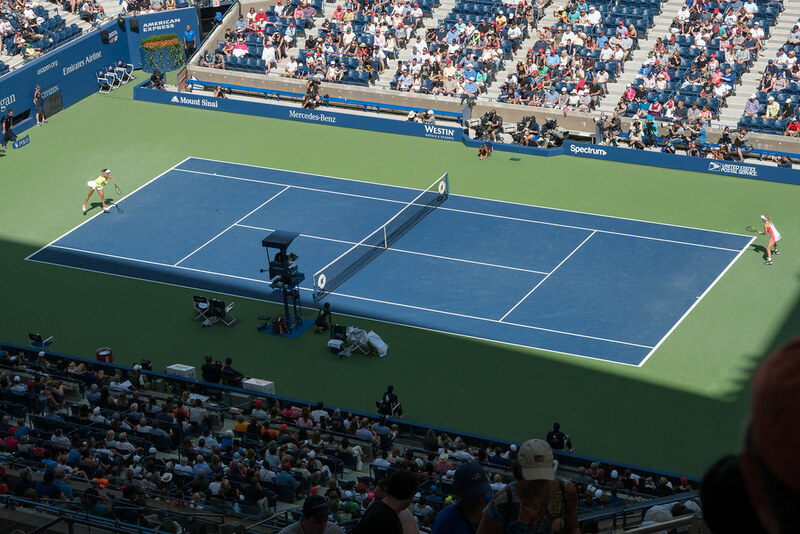 We then found our seats in the giant Arthur Ashe Stadium to see American Madison Keys (#9 in the world) play former #1 Caroline Wozniacki. The girls loved being in the stadium, despite the fact that our seats were way up high. Madison Keys lost sadly. 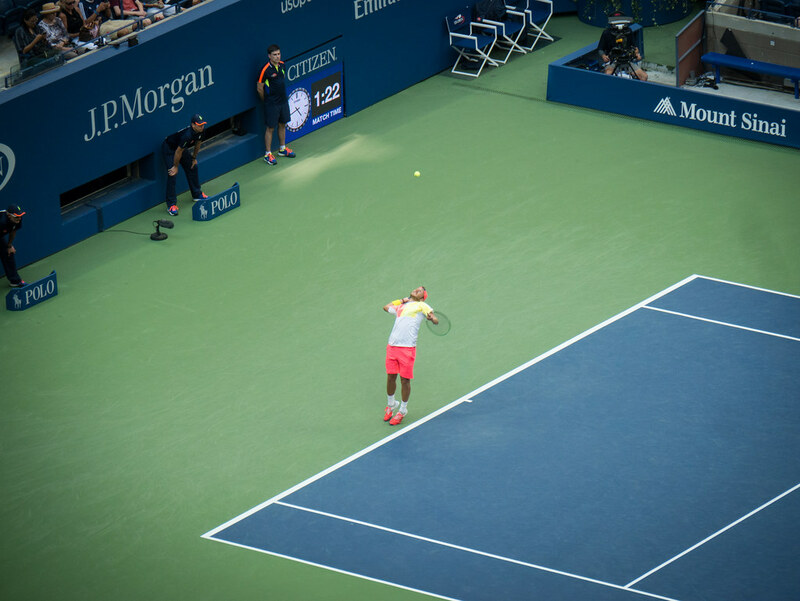 The next match up on Ashe was the headline match of the afternoon featuring Raphael Nadal. The girls wanted to stay and watch it, but I really wanted to explore the grounds a bit. I assured them that we had plenty of time to see Nadal play, though, as his matches lasted forever. So, we exited the stadium to see if we could catch some tennis action a bit closer up. 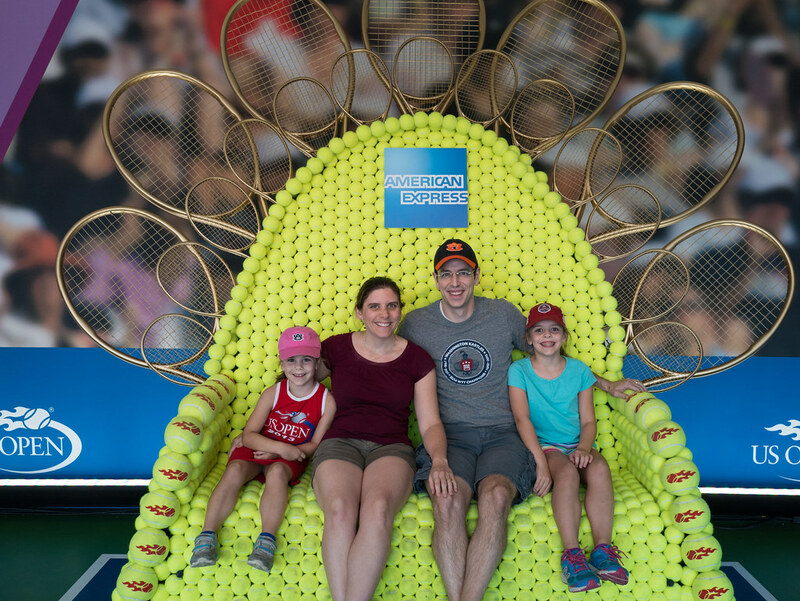 When wandering around the grounds, Jen saw this couch made of tennis balls. She knew we had to get a picture on it. We then headed back to court 11 to see Bethany Mattek-Sands and Lucie Šafářová take on Karolína Plíšková and Julia Görges. This time, we sat on the opposite side right next to the court. I joked with Molly that we could reach out and grab their racquets we were so close (we did not do that, though). Lucie Šafářová gets seriously high in the air on this forehand. 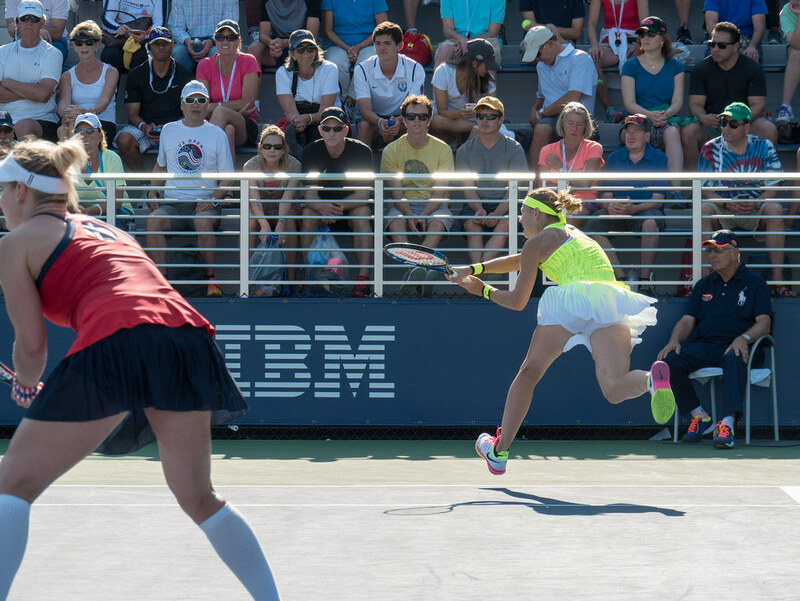 It felt like Bethany Mattek-Sands might run into me as she ran for this backhand. Bethany Mattek-Sands ripped this forehand. 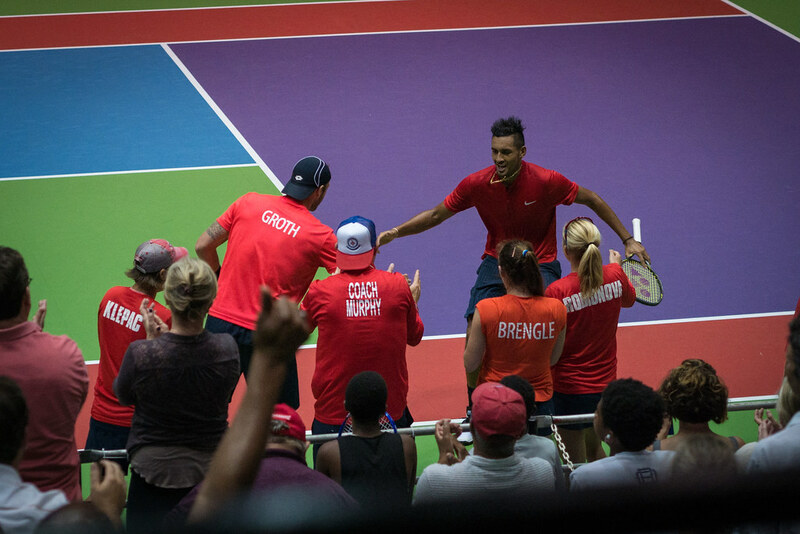 They pulled off the comeback upset, winning 2-6, 7-5, 6-3 and advancing to the quarterfinals where they faced the other Americans we had seen earlier in the day. Mattel-Sands and Šafářová won that as well, and ended up winning the whole tournament. They were awesome to watch, and I was glad to see them have so much success. 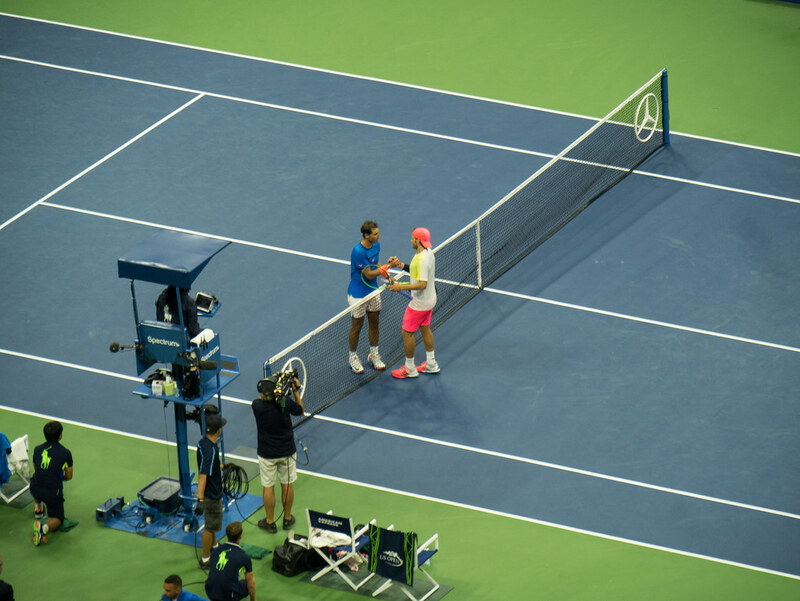 We then headed back to our seats in Arthur Ashe Stadium, where Raphael Nadal was playing Lucas Pouille. Despite being out of the stadium for almost two hours, we only missed the first set of that match. As Nadal often has epic matches, I was sure there would be more more to see. He did not disappoint us. Lucas Pouille really impressed me (and the rest of the world). He’s now my favorite up-and-coming player. He had a ton of heart, and never gave up. It also helps that his playing style is quite similar to mine, and he plays with the same racquet as me. It makes it easy to identify with him. This match lasted a long time, but the stadium remained mostly packed throughout despite that. This panorama also gives you an idea of just how high up our seats were. 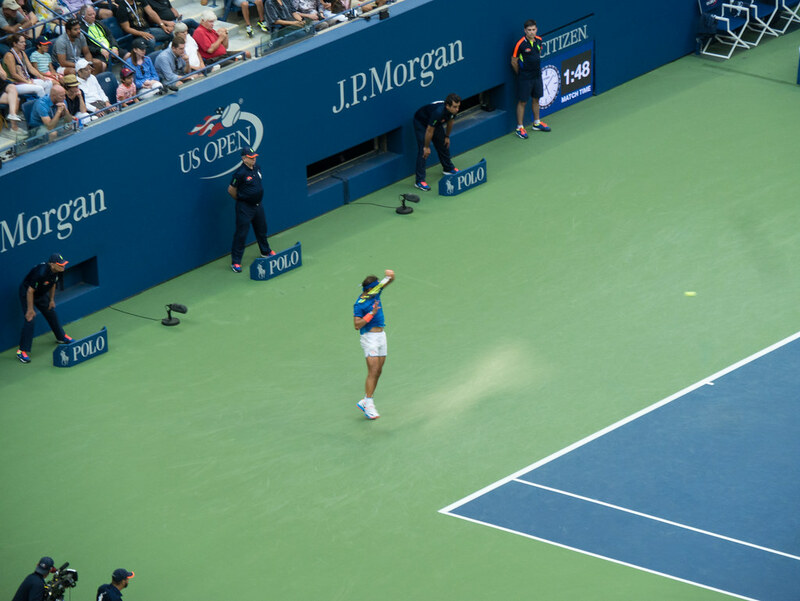 Here, Nadal is about to serve the final point, and the match clock stands at 4 hours and 7 minutes. It was a seriously long match (the longest of the tournament). During the 5th set, Molly and Jen were ready to leave and beat traffic. Leah and I, however, would not consider leaving such a great match before it finished. Pouille pulled off an incredible upset, defeating Nadal 8-6 in the fifth set tie-breaker. Sadly, he went on to lose his next match to fellow Frenchman Gaël Monfils. Then we bought some T-shirts and headed to our car. Thanks to folks arriving for the evening session, folks leaving from the day session, and folks arriving for a New York Mets game (the stadium is next door), getting out of the parking lot was a pain. It took us about an hour, and then we drove home. Leah was asleep before we got out of the parking lot, but Molly stayed awake until we were on the New Jersey Turnpike. We ended up getting home at 1:22am, ending a very long and very fun day. I’m tired again just writing about it. Last week brought with it the start of school. 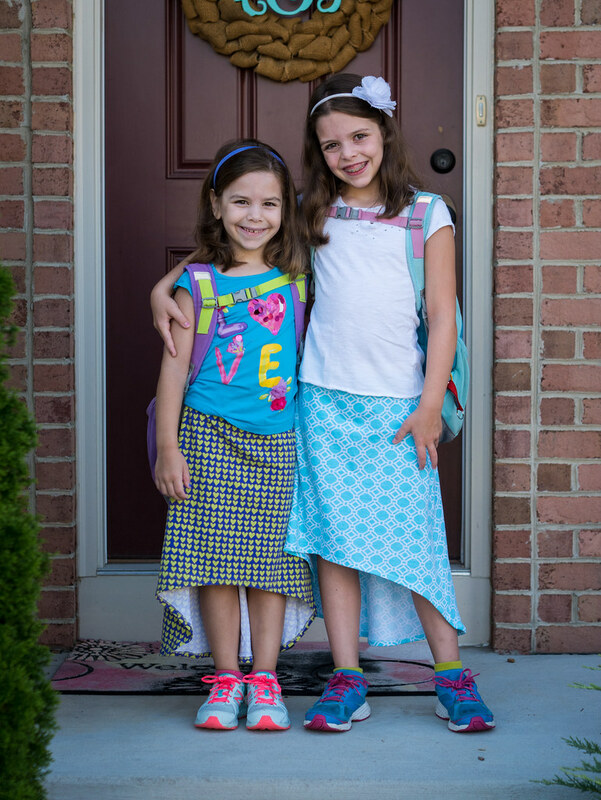 Here Molly and Leah are, ready for their first day. 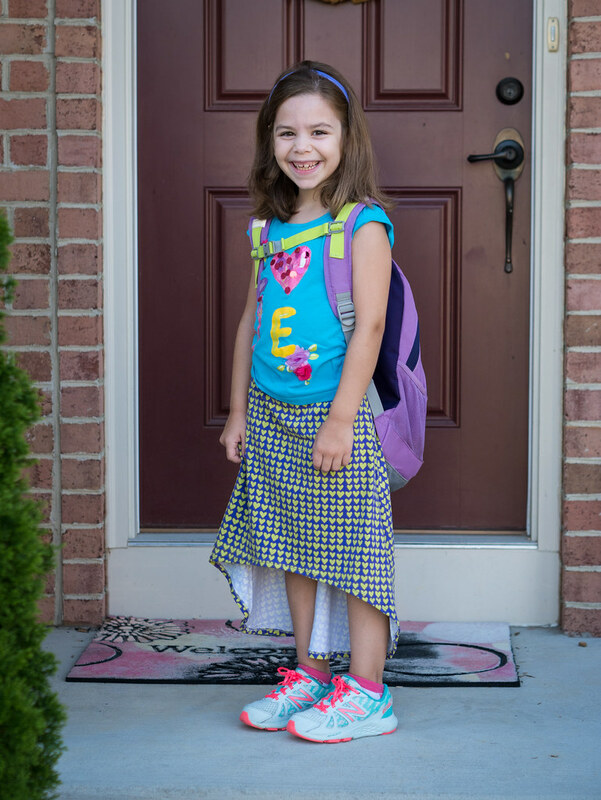 Leah’s very excited about her first day of first grade. 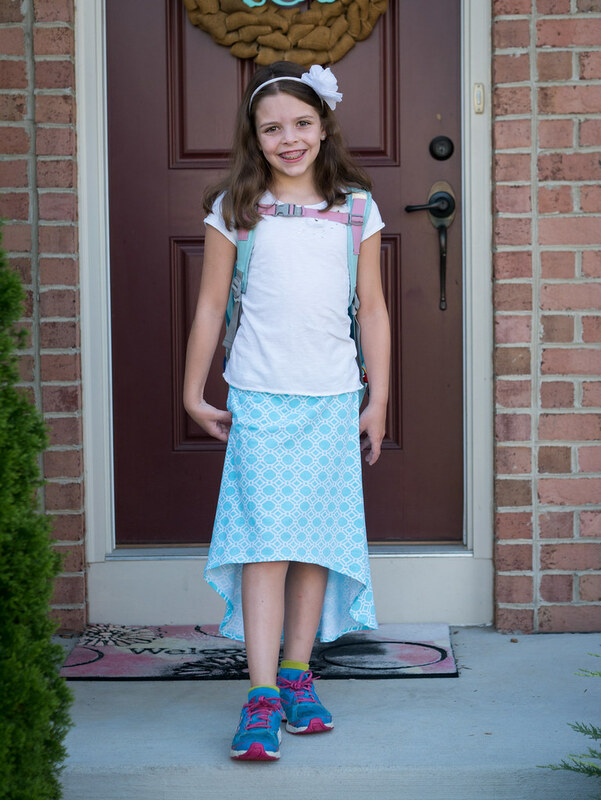 Hard to believe Molly’s a fourth grader now. After school, she made sure to tell us she only had two years before she was in middle school. Jen asked the girls what they wanted her to make them for the first day of school, and they immediately said they wanted hi-low skirts. They each picked out the fabric for their skirt. 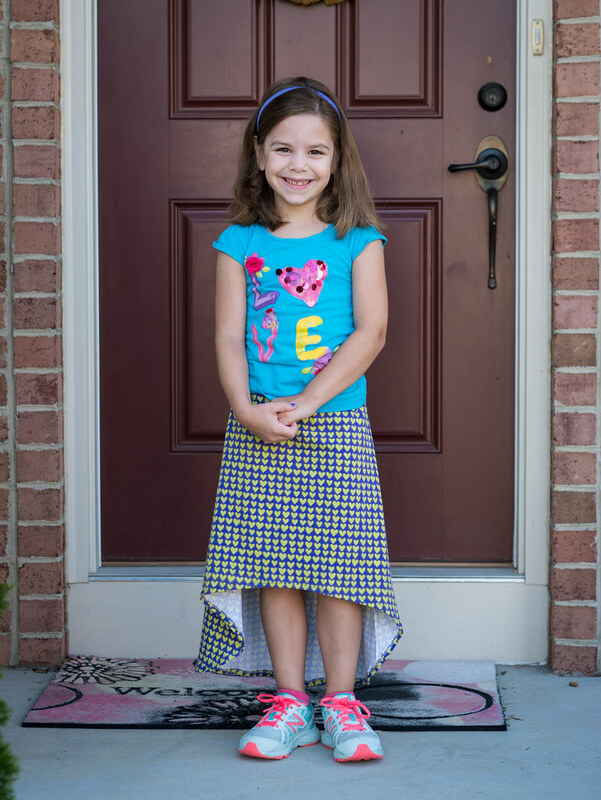 And here’s Molly’s hi-low skirt that Jen made. Molly’s ready to do some modeling with her fancy pose here (no coaching added, this was just how she chose to stand). Our usual neighborhood kids picture on the walk to school. 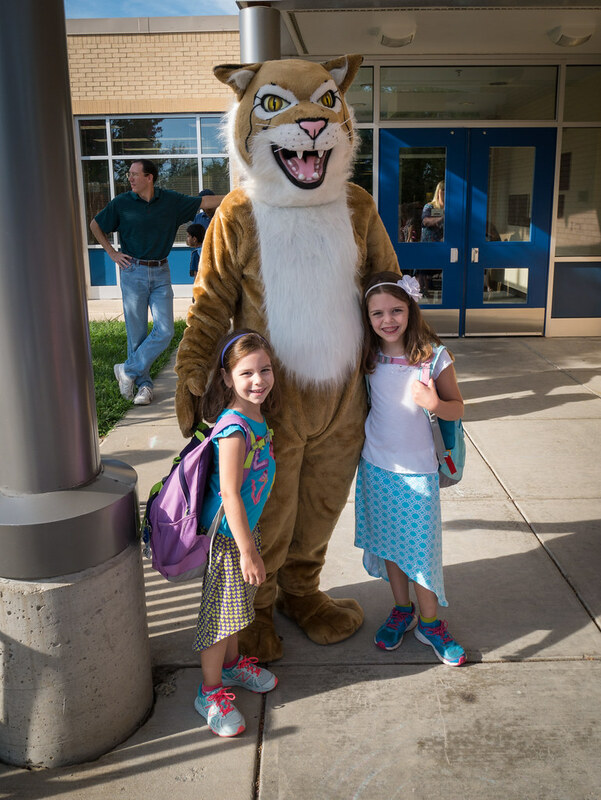 The Wildcat was waiting at school to greet the kids. Both girls had a great first day (and first week). We’re looking forward to a great year. 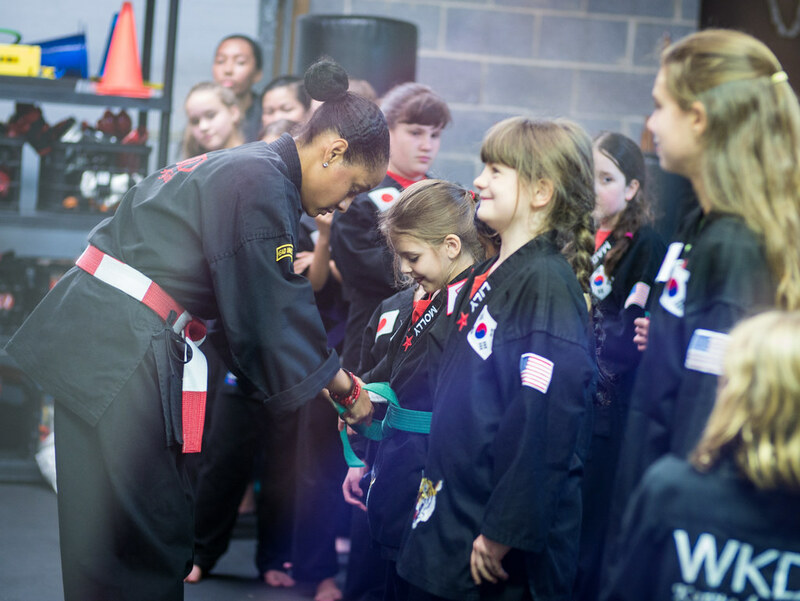 Molly’s now been doing karate for two full years, moving steadily up the belt ranks. 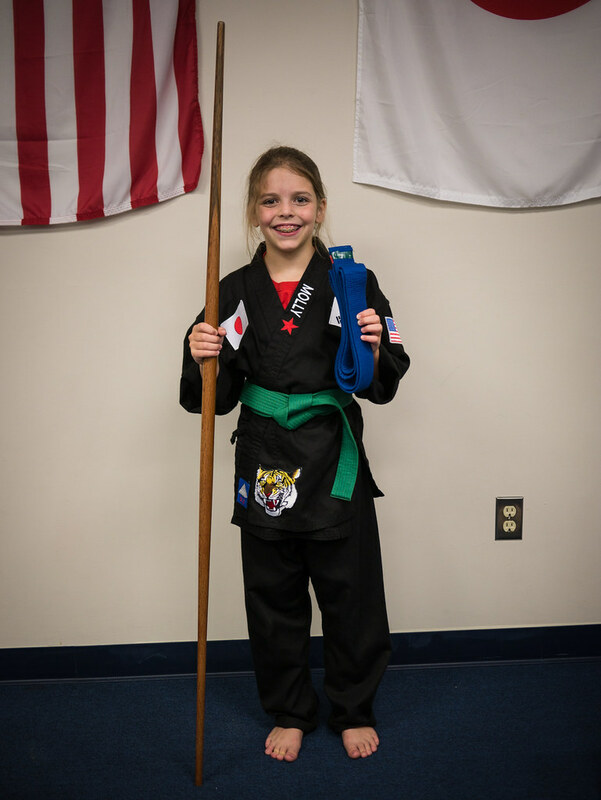 For her green belt test, she had to do her first bo staff kata. As you can tell, she’s so good she doesn’t need to open her eyes (kidding). 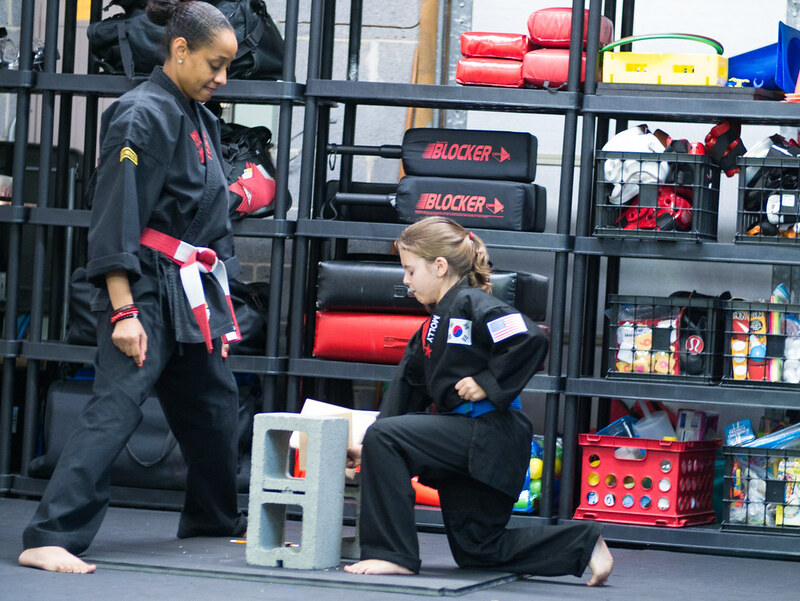 She broke a board for the second time at her green belt test as well. Apparently that doesn’t require her to open her eyes either. 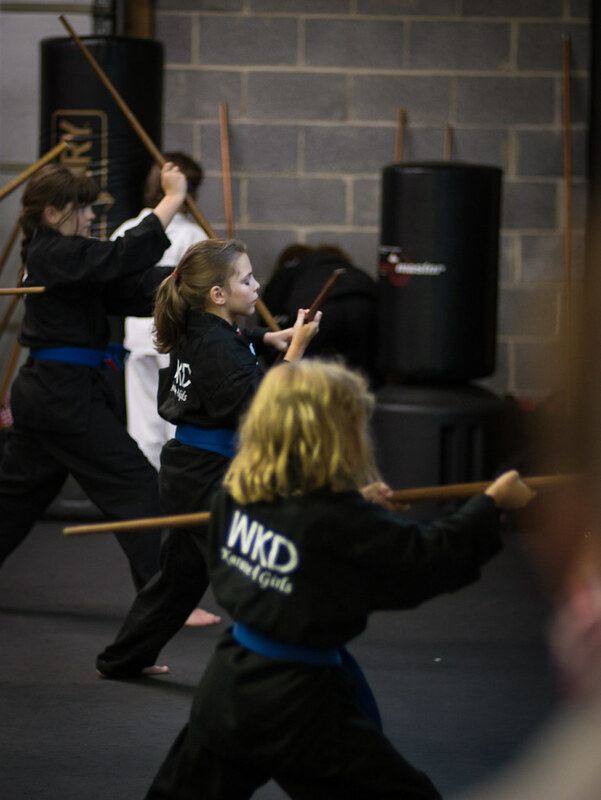 Here she is with her new green belt on, with her old blue belt in one hand and her bo staff in the other. Last week was the first week of school, and the Friday before that was again time for meeting teachers at sneak-a-peek. 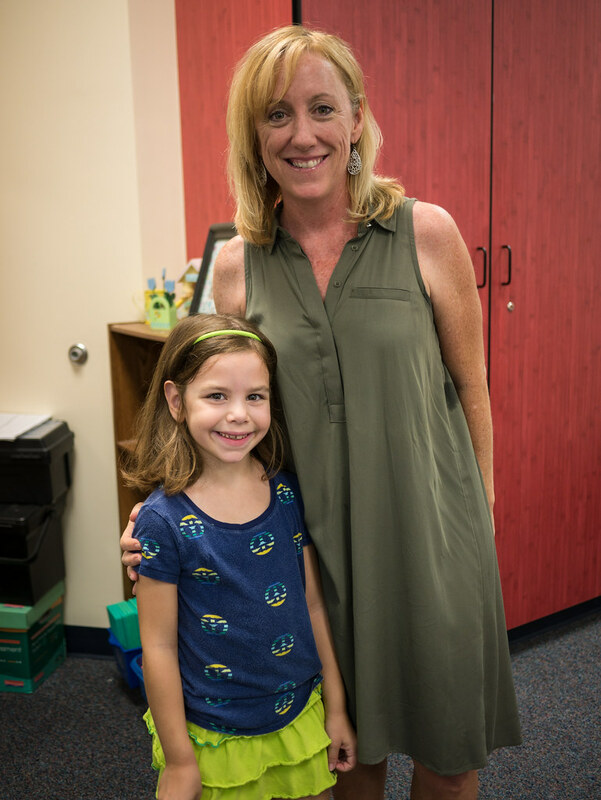 Here’s Leah with her new first grade teacher. And here’s Molly with her 4th grade teacher. And yes, she and her best friend Jordan are in the same class for the fourth year in a row. During Family Worship Month (August) at church, kids took part in the service. Molly got picked to be worship leader, and she did a great job! 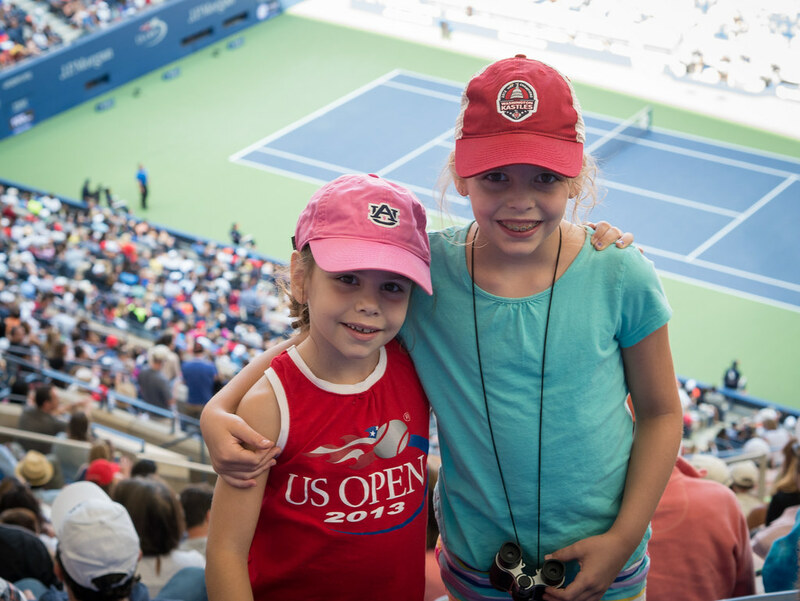 A few weeks ago (the day after Molly got back from camp), we took the girls to their first professional sporting event. 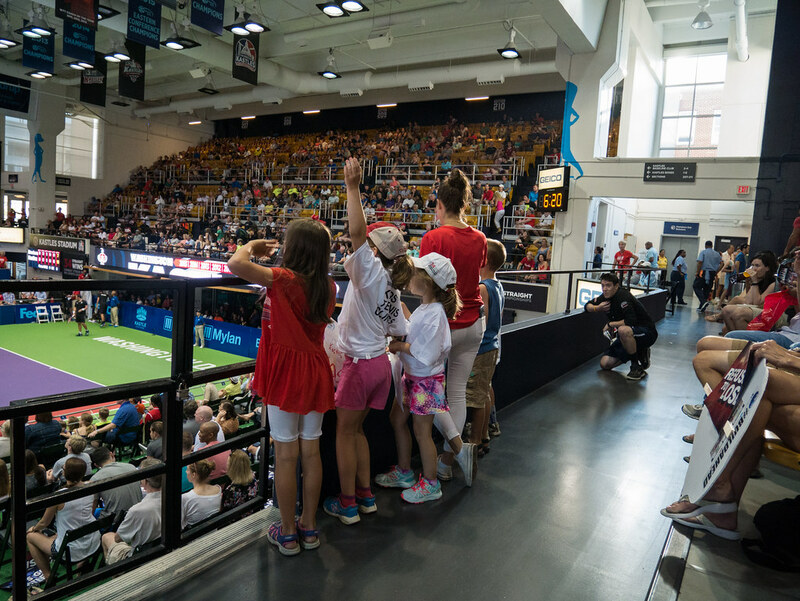 We went to see a Washington Kastles match. 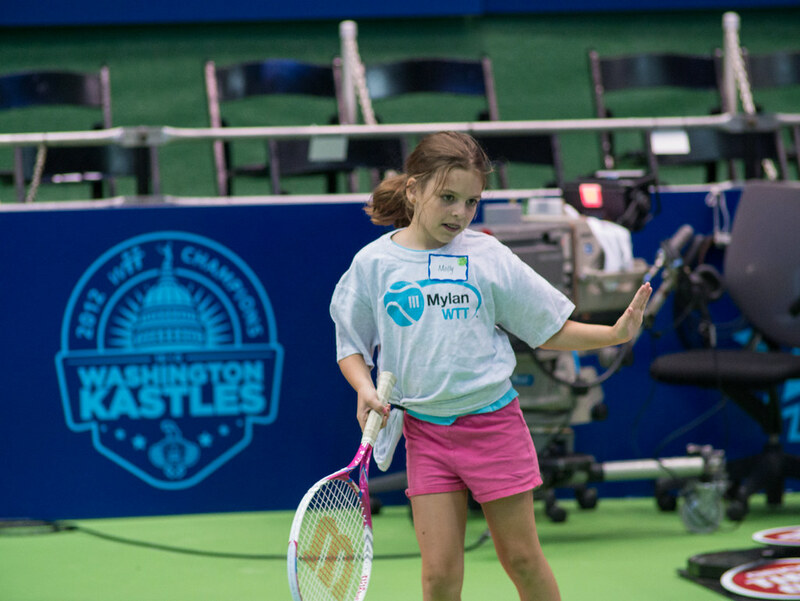 If you are not familiar with the Kastles, they are a World Team Tennis team. 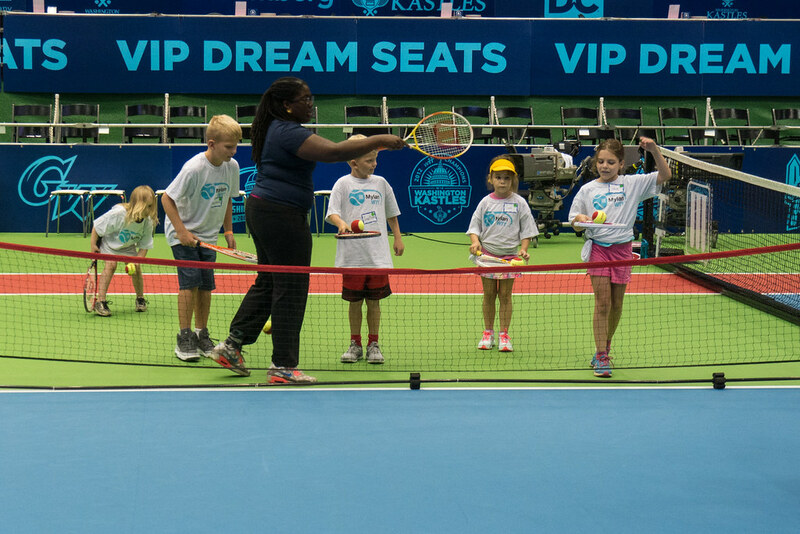 While most of professional tennis revolves around individual performances in the ATP and WTA, World Team Tennis offers pros and fans a team format and a lot of fun. 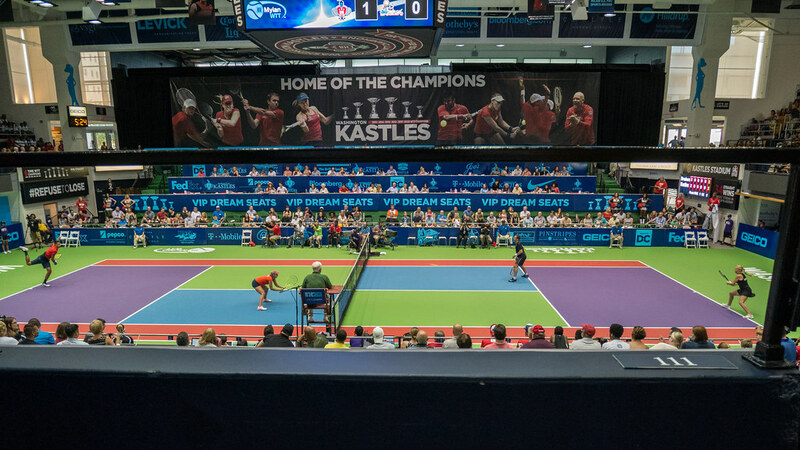 We went to see the Kastles on Family Day. 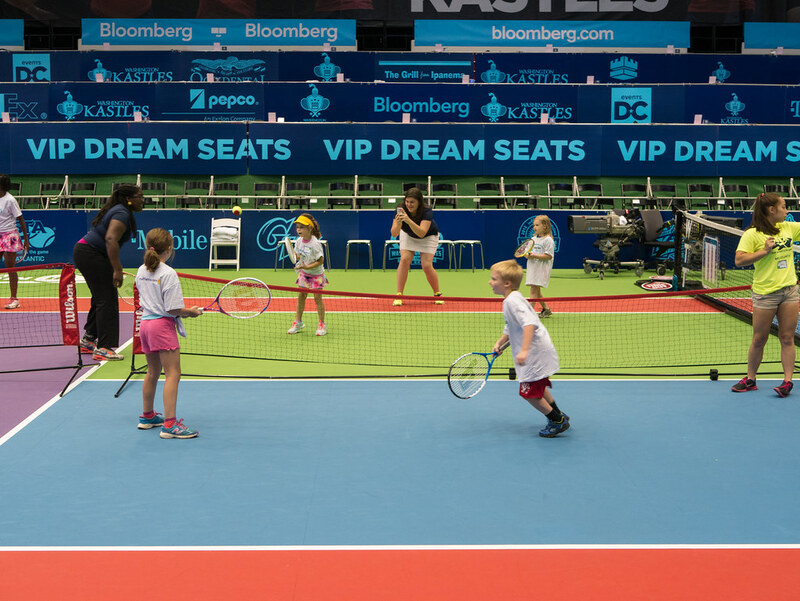 That meant they had a USTA Play Day in the stadium for kids a few hours before the match. Both Molly and Leah took part. 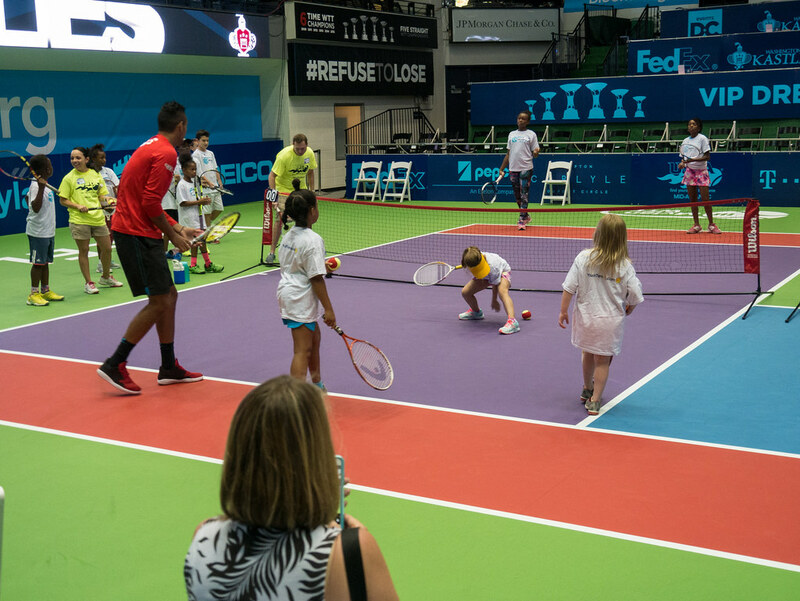 Not only did the kids get to play on the court, but Nick Kyrgios (currently #16 in the world) came out to play with the kids. He started with the court next to the girls, but got interrupted when our kids lost their ball and Leah ran onto his court to get it. Then Nick made it onto their court. 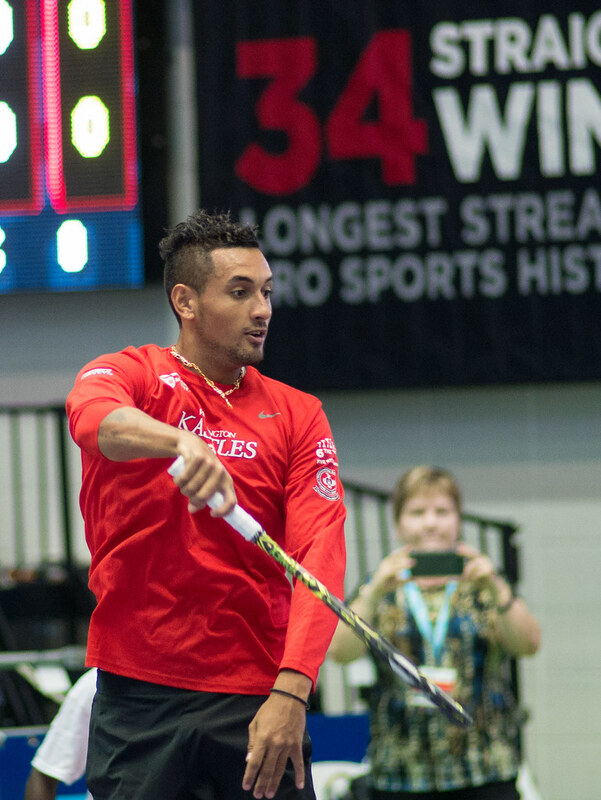 Yes, that’s Molly playing tennis with Nick Kyrgios. 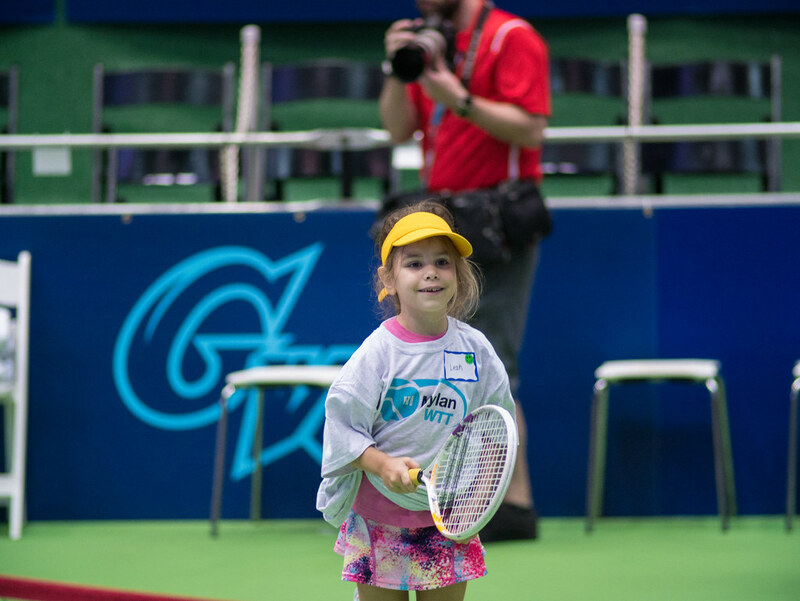 Leah knows to stand in ready position when Nick Kyrgios is hitting the ball to you. Nick then moved on to the next court, and our kids kept playing. Here’s Molly winning a ball balancing competition. They had a DJ playing music, which meant Molly spent a lot of time dancing on the tennis court. Most of the adults running things thought she was great. 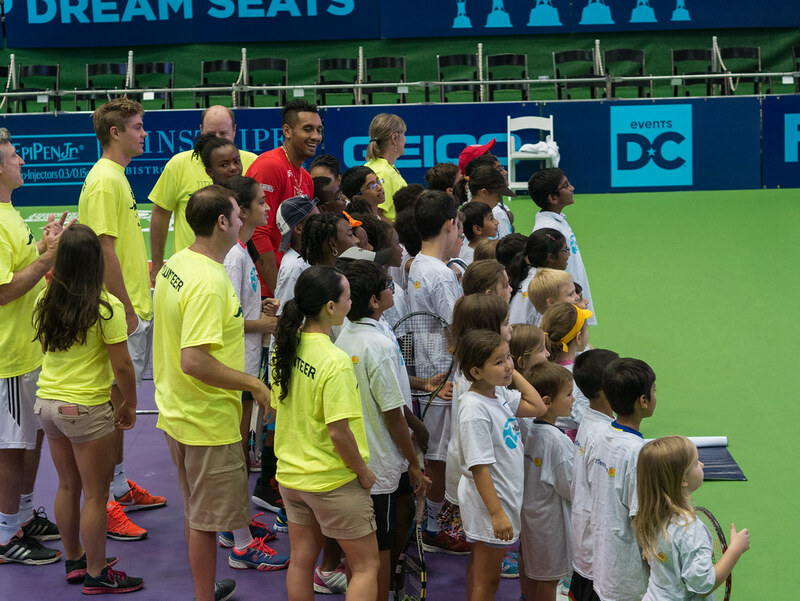 Nick Kyrgios showed the kids how an overhead smash is done. 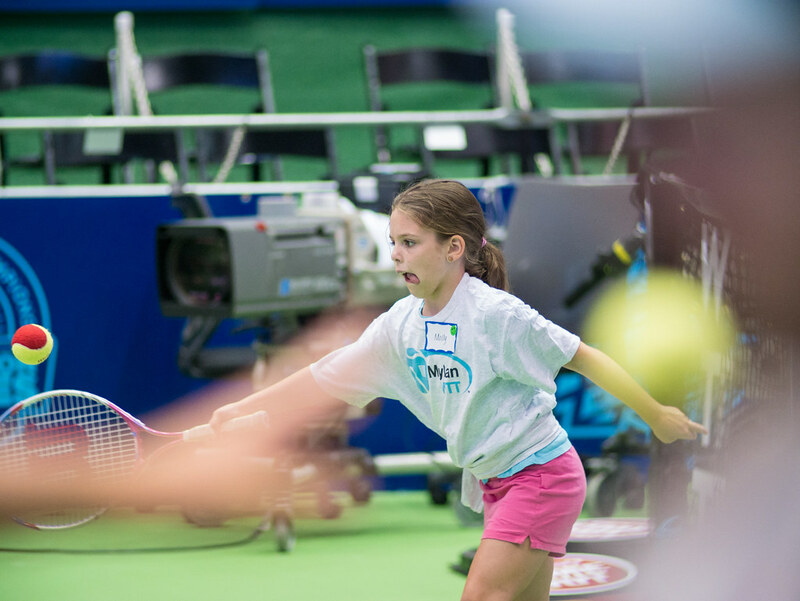 This is apparently the face you make when you hit a forehand. And you stand on one leg. Molly still has her tongue out as she reaches for this ball. The obligatory group picture with Nick before he headed out. Here’s the whole Play Day. They had 4 mini courts set up for the kids. 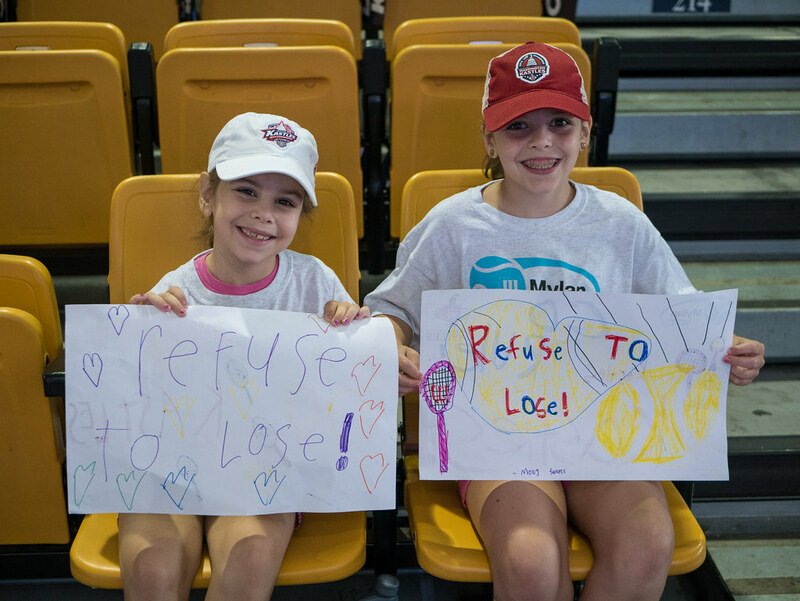 After the kids were done playing, the Kastles had a pizza party for them, as well as some arts and crafts stations to make signs. 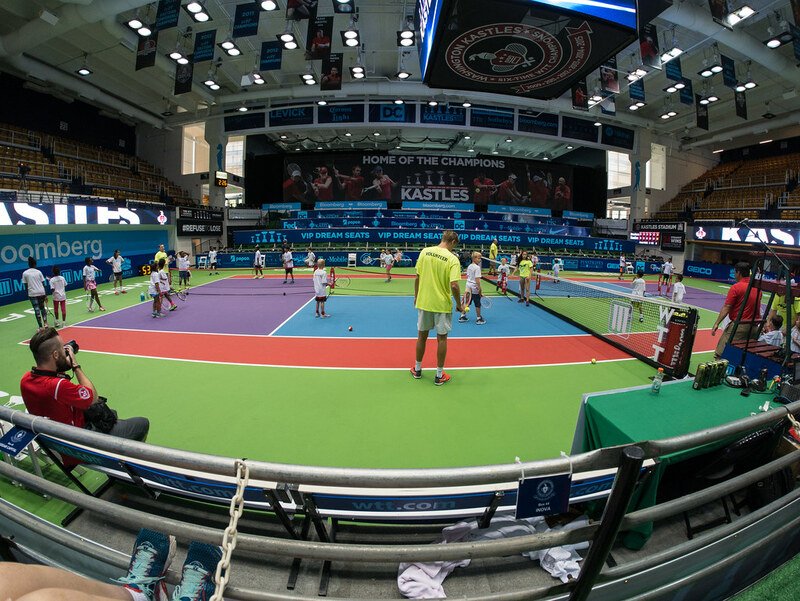 We also got to see the Kastles warm up. 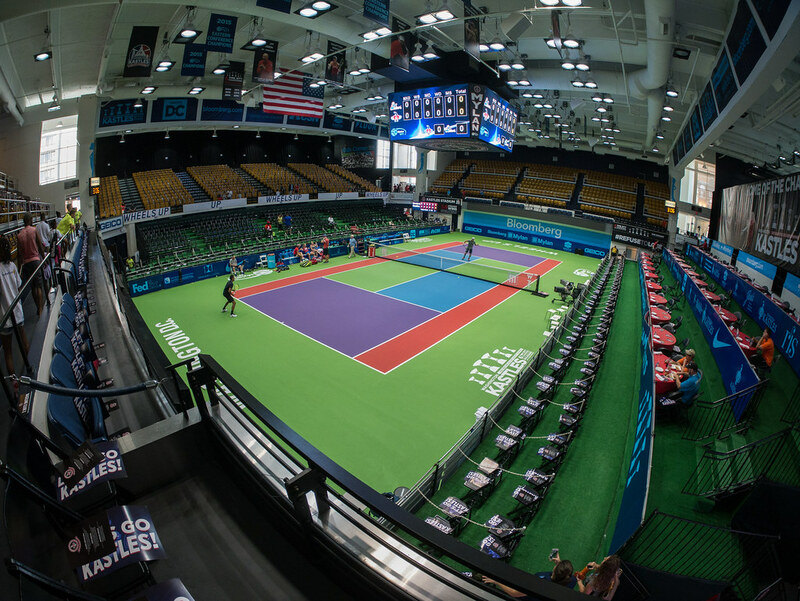 Here’s the entire mostly empty stadium, with Nick Kyrgios and Sam Groth warming up. 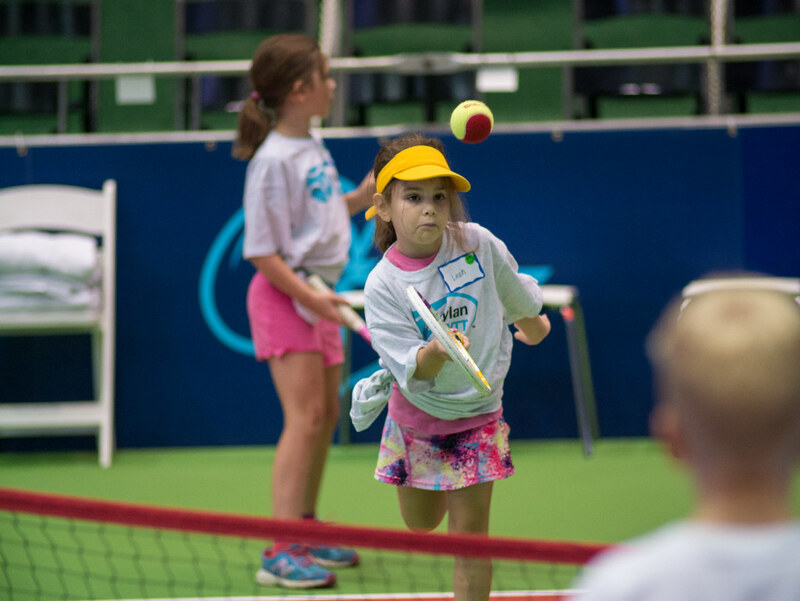 And their serves in action. 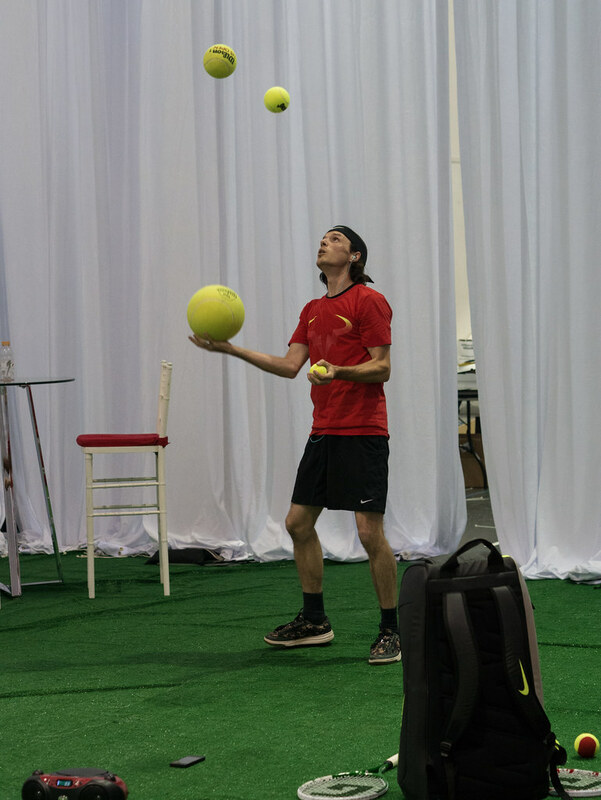 In addition to the pizza and crafts, they had a tennis-themed juggler put on an act. I don’t know if he’s always tennis-themed, or just for this event, but he was quite good. 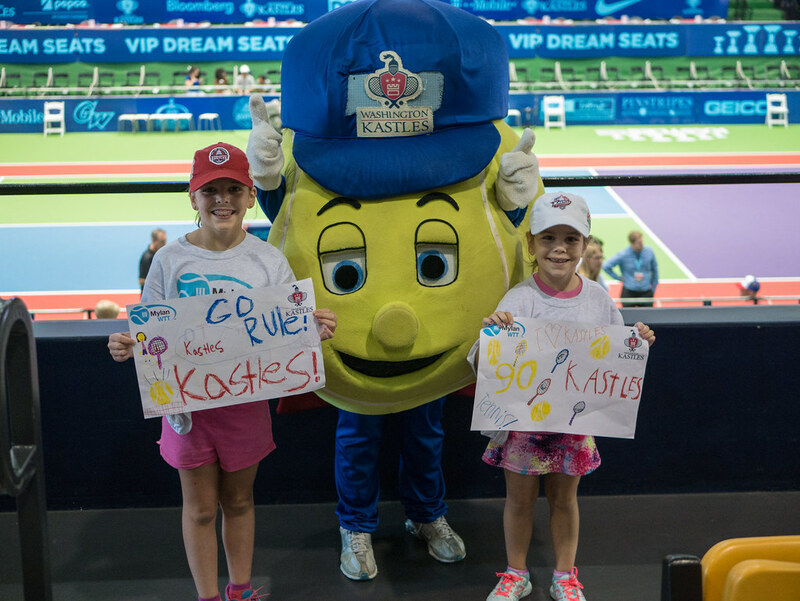 Once we got to our seats (front row of the upper deck), the girls got a picture with the tennis ball man. 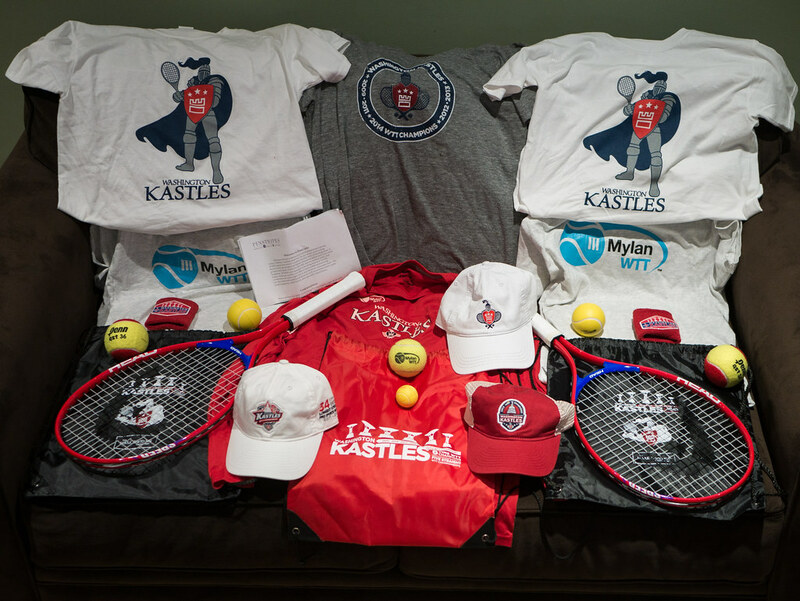 I proceeded to tweet this picture, which was picked as the Kastles’s favorite tweet, winning us a prize bag (more on that later). In our seats, with our signs. The girls got to go on the court to form the tunnel that the players ran out through. They were very excited to high five the players on the court, even the players from the other team. 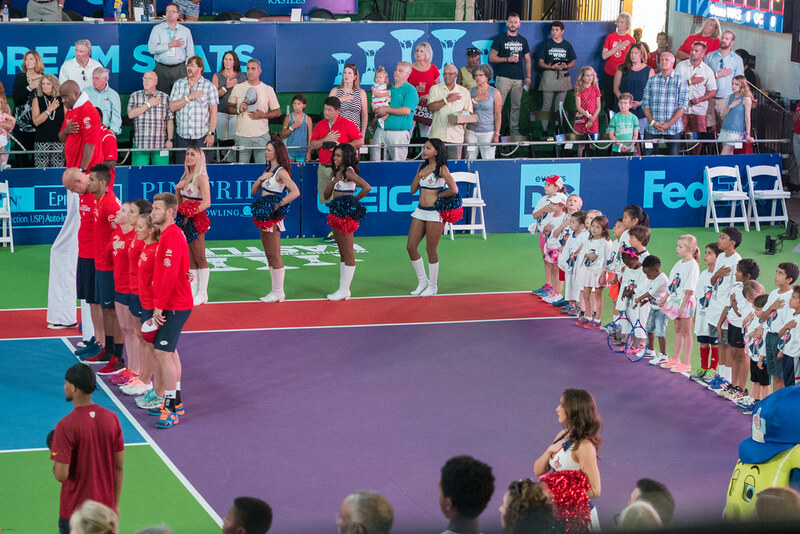 Then, they got to stay on court for the national anthem. 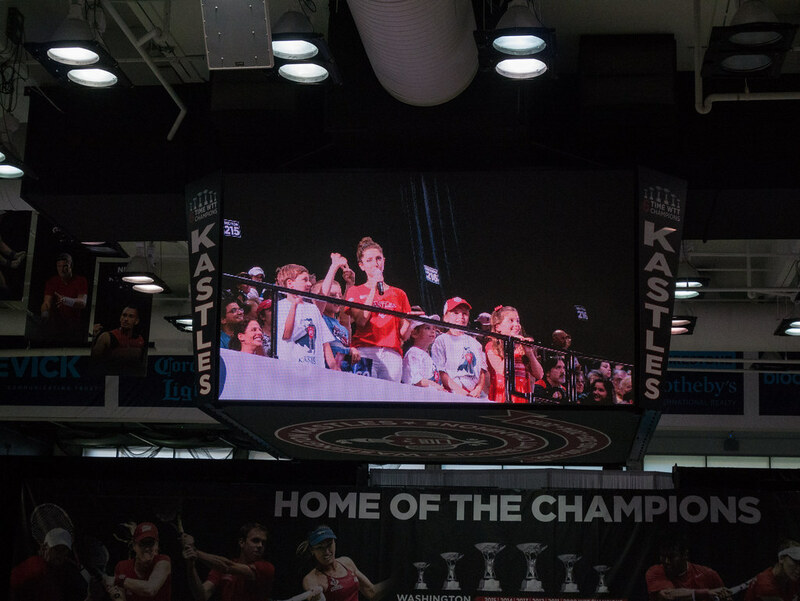 Then we got to actually watch the Kastles play. 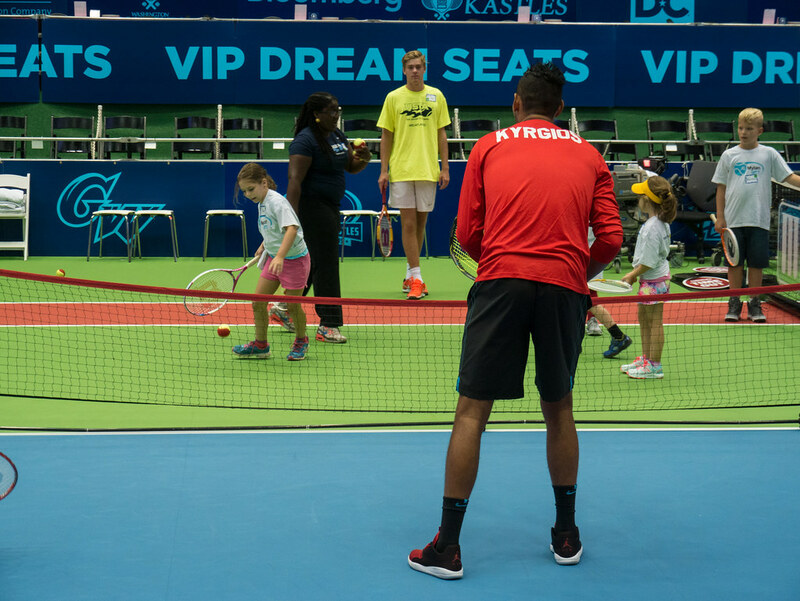 Here’s Nick Kyrgios and Andreja Klepac playing against Scott Lipsky and Alla Kudryavtseva from the Orange County Breakers. During breaks, they would show interviews and other quick spots on the big screen. They did one about Family Day, and wanted some kids in the spot. Since we were sitting on the front row of the upper deck, we were in the perfect spot for them to find us. Here’s what they looked like on the big screen during the spot. The match was a lot of fun of course, but I have fewer pictures of it. But here are a couple of serves. 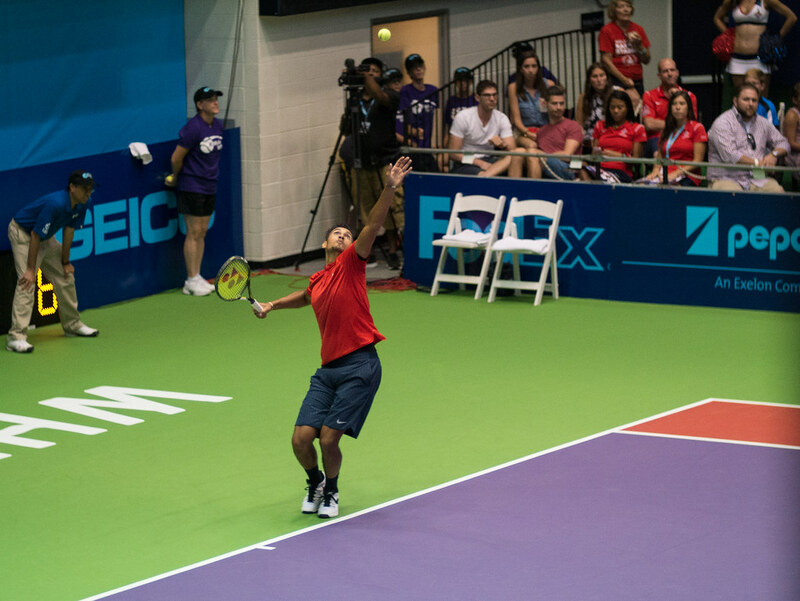 First, Nick Kyrgios serving in Men’s Doubles. 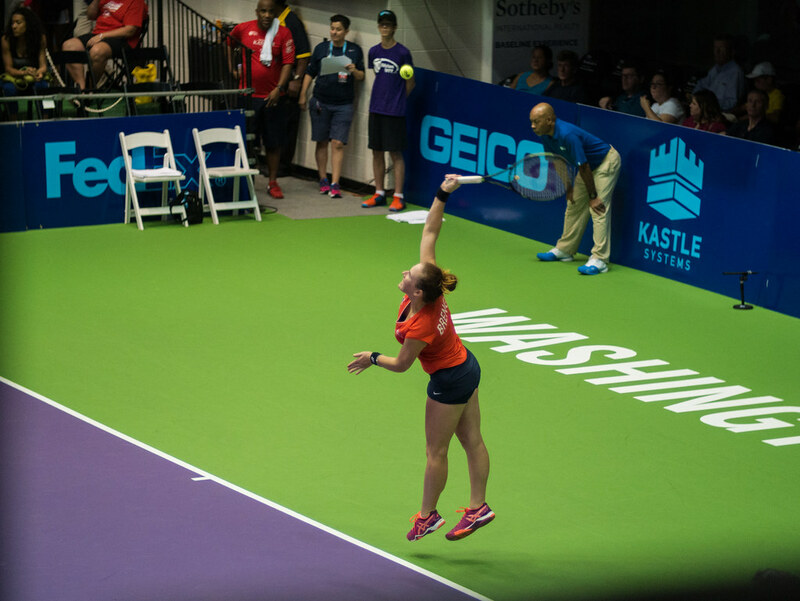 And here’s Madison Brengle serving in Women’s Doubles. 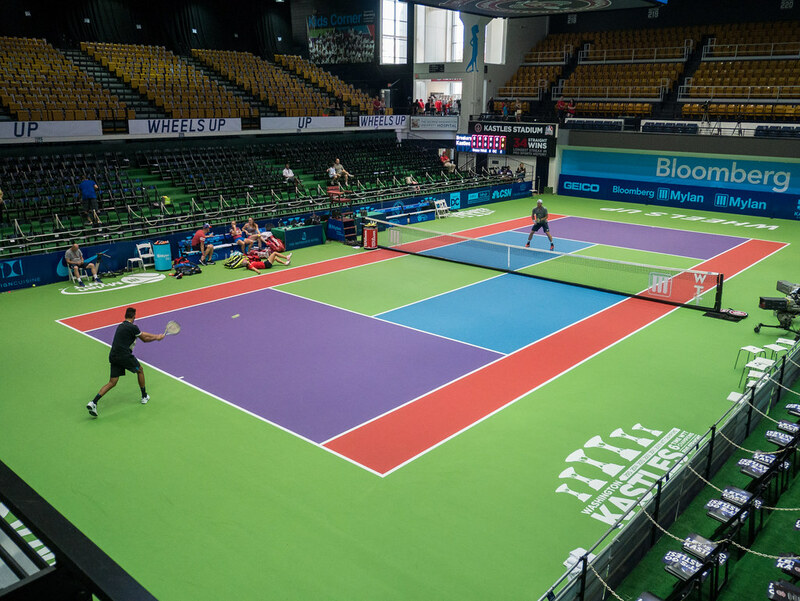 It ended up going into extended play, but the Kastles won! Here’s Nick rushing to his teammates after winning the final point. Quite the haul, especially since the tickets were only $12 each in the first place.